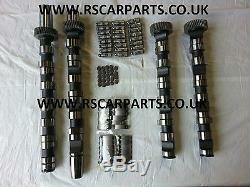 CAM CAMSHAFT KIT AUDI A4 A6 C5 A8 ALLROAD SKODA SUPERB VW PASSAT 2.5 TDi CAMSHAFT 059109021Q X 1 CAMSHAFT 059109021BQ X 1 CAMSHAFT 059109022BC X 1 CAMSHAFT 059109022P X 1 VALVE LIFTER 059109521E X 24 ROCKER ARM 059109444W X 24 THRUST PAD 059109075E X 24. PLEASE NOTE CARRIAGE COST QUOTED IS TO UK MAINLAND ADDRESSES ONLY. The item "AUDI A4 A6 A8 VW SKODA 2,5 Tdi V6 NEW Camshaft Kit Set for Afb Ake Akn Aym Bfc" is in sale since Monday, April 18, 2016.